14-year-old Jack Mason is orphaned when his parents die in a circus. One day, a detective Ignatius Doyle is looking for an assistant, and the head of the orphanage asks Jack if he’d like to be the assistant. The acrobatic Jack accepts, and is straight away launched into a full-on adventure. Scarlet Bell, a 15-year-old girl comes to Mr. Doyle, and tells him that her father has been missing. They search Scarlet’s house and find one of Leonardo da Vinci’s original paintings that had gone missing, only with a firebird above it. What does this mean? Leonardo certainly didn’t paint a firebird into his painting. 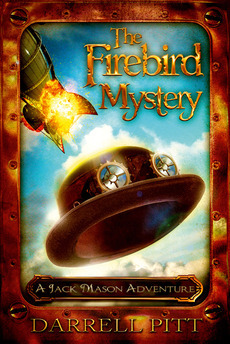 This was immediately followed by another case, when Professor M, a criminal mastermind gets hold of an atomic bomb that the ingenious Phoenix Society had created accidently. This atomic bomb can reduce London into rubble, killing thousands of millions of people in the process. Will they get out of this alive? A thrilling book that contains adventurous characters that are willing to risk their lives. I would rate this book 4 ½ stars. Recommended to girls and boys 10 and above who love crime and mystery solving. Celine is one of our regular book reviewers. Her most recent review (if you don’t count this one) was of The Apothecary. If YOU would like to send us a book review, check out our submission guidelines. Happy reading!